Good guy with a gun myth: Guns increase the risk of homicide, accidents, suicide. The NRA is wrong: Owning a gun is far more likely to harm you than protect you. 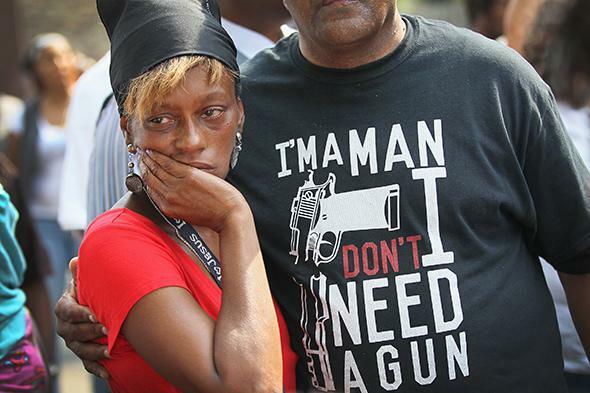 Audry Miller is comforted by community activist Andrew Holmes during a memorial service for her 11-year-old granddaughter, Shamiya Adams, on July 20, 2014, in Chicago. Adams was killed when a stray bullet flew through an open window and an interior wall and struck her in the head. We know, in the world that surrounds us, there are terrorists and home invaders and drug cartels and car-jackers and knock-out gamers and rapers, haters, campus killers, airport killers, shopping-mall killers, road-rage killers, and killers who scheme to destroy our country with massive storms of violence against our power grids, or vicious waves of chemicals or disease that could collapse the society that sustains us all. LaPierre’s central message: Owning a gun is the solution. The world is a scary place. There are bad guys everywhere threatening you and your family, and the only thing they’re afraid of is a gun in your hands. 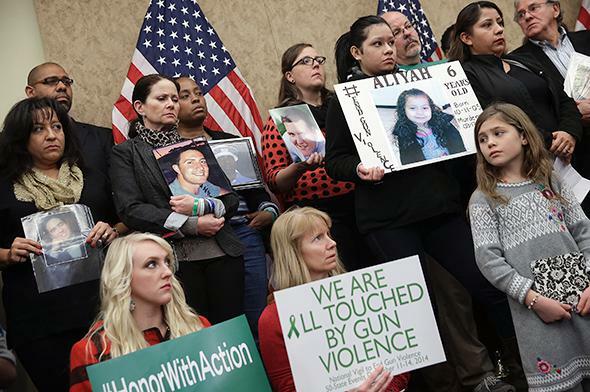 Family members who have lost loved ones to gun violence gather with members of Congress during a press conference on Dec. 10, 2014, in Washington. The evidence against firearm ownership becomes even stronger when suicides and accidents are included in the analysis—guns make both much more likely and more fatal. There can be nothing closer to a consensus in the gun debate than this point. Indeed, every single case-control study ever conducted in the United States has found that gun ownership is a strong risk factor for suicide, even after adjusting for aggregate-level measures of suicidality such as mental illness, alcoholism, poverty, and so on. These findings are further supported by a case study examining the impact of a 2007 Missouri decision to repeal its permit-to-purchase handgun licensing law. The research concluded that the repeal was associated with a 16 percent increase in annual murder rates, indicating that state gun control laws have a significant impact on the homicide rate. Suppose a criminal has just broken into your house brandishing a firearm. You need to protect yourself and your family. Wouldn’t anyone feel safer owning a gun? This is the kind of narrative propagated by gun advocates in defense of firearm ownership. It preys on our fear. Yet, the annual per capita risk of death during a home invasion is 0.0000002, which, for all intents and purposes, is zero. Despite the astronomical odds against being killed, this fear of home invasion often drives people like Becca Campbell of Ferguson, Missouri, to gun ownership. This past November, Campbell was riding home in a car with her boyfriend after purchasing a gun, preparing for the unrest expected to follow the grand jury decision about whether to pursue criminal charges against the policeman who killed Michael Brown. She joked that “we’re ready for Ferguson,” waving the gun. Distracted, the boyfriend ran into the car ahead of them, and the gun fired, killing Campbell. 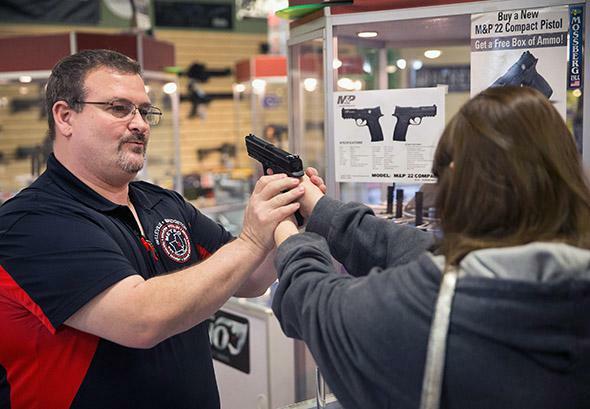 Steven King helps a woman shop for a handgun for home defense on Nov. 12, 2014, in Bridgeton, Missouri. Moving from state-level analysis to the household or individual, the risks for gun owners become even more apparent. A recent meta-analysis of 16 studies examined the relationship between firearms and gun deaths. Gun ownership doubled the risk of homicide and tripled the risk of suicide. This research is bolstered by a national survey that found that a gun in the home was far more likely to be used to threaten a family member or intimate partner than to be used in self-defense. Gun advocates may counter that this doesn’t reveal the entire picture. After all, case studies of these fatal gun incidents can’t capture the benefits that widespread defensive gun use bestows on society. However, despite the NRA’s mantra that there are millions of defensive gun uses every year, empirical data reveals that DGUs are actually extremely rare. Criminal uses of firearms far outnumber legal defensive uses. The evidence shows that there may be fewer than even 3,000 DGUs annually. In comparison, there are 30,000 gun deaths annually, and many more injuries and shattered lives. The costs of gun ownership unequivocally outweigh the benefits. In light of the overwhelming evidence that guns are a public health threat, gun advocates often retreat to an “it could never happen to me” mentality. This worldview is tragically mistaken. Consider the case of Veronica Dunnachie. She was, by many gun advocates’ definition, a good gal with a gun. A strident voice for gun rights, she was an open carry advocate, dedicated to expanding the unlicensed open carrying of firearms. In Texas, open carry is currently restricted to long guns; she pushed to include handguns. She frequently attended rallies and protests organized by Open Carry Tarrant County (an offshoot of Open Carry Texas). In a domestic dispute on Dec. 10, she allegedly shot and killed her husband and stepdaughter. Horrified, Dunnachie called a friend, telling him she “had just done something bad” and, at his urging, checked herself into a nearby mental health clinic. Everyone likes to pretend that he or she is more rational, more responsible, and more immune to the risks that gun ownership poses relative to the average American. Yet, we know from gun violence statistics that many are simply misjudging their own competency. Everyone thinks he or she is above average, but half are mistaken. Rather than gangbangers and maniacal criminals going on killing sprees, it is cases like Dunnachie’s that drive gun violence. FBI data reveal that about twice as many homicides result from arguments than from felonies, and gang violence is only a small contributor. In a careful study of the relationships between homicide victims and perpetrators, analyzing data from 1981–2010, Michael Siegel and his colleagues reveal that for every 1 percent increase in gun ownership, there is a 0.9 percent increase in nonstranger homicide. Although stranger homicide does increase slightly as gun ownership rises, the increase is not statistically significant. This indicates that there is no deterrence effect from firearm ownership and that a firearm significantly increases the owner’s chances of killing or being killed by somebody he or she knows. 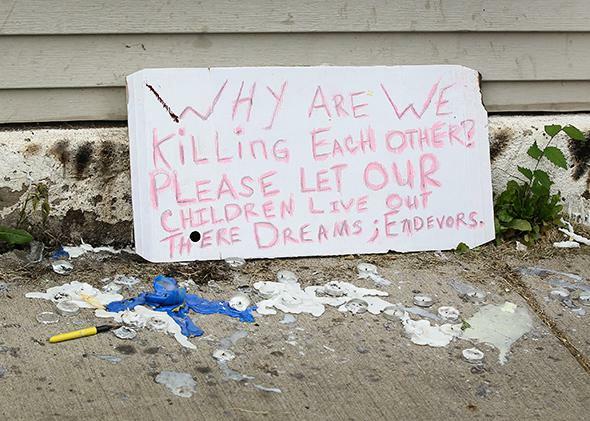 Melted candles stain the sidewalk during a memorial service for Shamiya Adams on July 20, 2014, in Chicago. Gun advocates may argue that this reality is a consequence of the fact that there are too few guns; perhaps nonstranger homicides would be lower if everyone you knew were packing heat. Yet a study examining data from the National Crime Victimization Survey found that people who used any weapon other than a gun for defense were less likely to be harmed than those who used a firearm. So before you purchase a gun for self-defense, please pause to reflect. Your weapon is much more likely to end up being used to harm than for good, even if you’re one of the “good guys.” The odds are not in your favor.